Halloween provides the perfect excuse to indulge in fantastical, impractical fashions. Still looking for costume ideas? I've got some suggestions. The Doll.This look rests on the the oversized eyes and big hair. Exaggerate your eyes with heavy duty false lashes and white liner on the inner rim, and get hair of Barbie doll proportions with plenty of extensions. Inspiration: Lily Donaldson shot by Greg Kadel in Numéro 64. After seasons of excess embellishment à la Spring 2004, designers began to pare down looks and move towards a "new minimalism" as early as Fall 2005. The movement picked up speed for Spring 2006, and, if the Spring 2007 resort collections are any indication, is going strong for Spring 2007. Unlike the sometimes stark, sexless minimalism of the nineties, the "new minimalism" is defined by simplicity and subtle prettiness. The shapes and details are different; there are bubble skirts, cropped jackets, touches of volume, drop waists, cropped pants, pintucks, pieces adorned with simple embroidery, and asian "robe"-inspired tunics. We are seeing lots of monochromatic looks but they are not boring and they are not "matchy-matchy." And though it isn't clear from the images in this particular post, the "new minimalism" isn't colorless--check out the Derek Lam Spring 2006 collection and you'll see what I mean. As an economist-in-training, I am loving the new minimalism. Minimalism is by nature efficient; a girl can select a minimalist outfit in two minutes, whereas it might take half an hour to assemble and accessorize a maximalist look. Additionally, if much of the minimalism of the nineties was boring, indeed the "dressing equivalent of swallowing food to fill your stomach--bypassing the fuzzy taste buds" as this author suggests, the new minimalism offers both simplicity and interest. I can't wait to see more in the Spring 2007 collections! Pictured above are pieces consistent with the "new minimalism" from the Spring 2007 resort collections. Designers: (clockwise from top left) Behnaz Sarafpour, Zac Posen, Stella McCartney, Dior, Valentino, Versace, YSL, Doo.Ri. Photos from Firstview and Style.com. We have all experienced dress code related frustration at some point. The truth is, most company dress codes are somewhat ineffective at serving their intended purposes. The Wall Street journal recently featured an article discussing a current wave of dress code "crackdowns" at companies across the country. I won't paraphrase that article in this post, but it did get me thinking about common flaws in dress codes and how professional dress codes might be improved. After all, this is a topic directly relating aesthetics and economics. Behavioral economists study the effect of variables related to the aesthetics and ergonomics of the office on employee productivity. If lighting or the wrong size chair can significantly impact employees' productivity, surely clothes can have a similar effect. In fact, experience and logic tell us that clothes can support or detract from efficiency: Appearances of coworkers and clothing-induced discomfort (in the form of self consciousness or actual physical discomfort) can be distracting. So what then are the most common flaws of professional dress codes? Let's first consider what such a code is meant to deal with and then step back and see how traditional dress codes measure up. 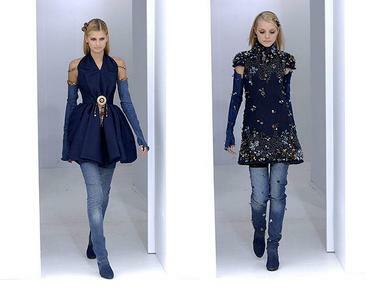 I love how Lagerfield set off the Chanel Fall 2006 Couture collection with denim. In fact, I am going to replicate this look this weekend...much to the chagrin of my boyfriend. If you are going to try this look out as well, I have a couple of suggestions: First, since you probably don't own a pair of denim thigh high boots, use jeans--but make sure that the jeans are (a) skinny or straight and (b) longer than you'd typically wear so as to cover as much of your shoes as possible (but watch out for that strange look of jeans that are not meant to be pulled down over shoes. I think you know what I mean). Also, pay attention to the length and shape of your dress. Use your judgement. Just saw The Devil Wears Prada and thought I'd take a moment to blog about the highly anticipated wardrobe. The verdict: Patricia Field played it safe, and there was a lamentable lack of Marni. Of course, it wouldn't have been wise to base the bulk of the wardrobe on designers unrecognizable to the majority of the audience. To do so would mean making viewers feel unpleasantly out of the fashion loop. But head-to-toe Chanel? Newsboy caps? IMHO, the movie could have used at least a few mentions of smaller, cult designers. In any case, the movie is still worth seeing. It's fun to see (and scrutinize) the outfits for yourself. And I especially liked Miranda's explanation of "trickle down" fashion.